Much of Japanese culture has its roots in China. Buddhism was first introduced around 522 via Korea and closely related to the power of the Japanese state. The Prince Shotoku Taishi 聖徳太子, born in 574, was a great promoter of State Buddhism and began to send embassies to China to study Chinese civilization in depth.
. Embassies to T'ang China 遣唐使 kentooshi . we realize that many have their roots in ancient Chinese poetry and painting. Chinese poetry was widely studied by the poets of the Heian period. And the Heian poetry had its strong influence on the poetry of the Edo period. Not only kigo, but many themes of haiku by the old masters referre back to Chinese poetry. Matsuo Basho was a keen student of Chinese poetry and Taoism in his youth. was an influential Chinese philosopher who lived around the 4th century BCE during the Warring States Period, a period corresponding to the philosophical summit of Chinese thought — the Hundred Schools of Thought, and is credited with writing—in part or in whole—a work known by his name, the Zhuangzi.
. Shoomon 蕉門 Shomon - Basho's Students .
. WKD - Tao, Dao and Kigo . "Poetry Pillow words" utamakura　歌枕"
. Place names and Sooshi 荘子 .
. 風羅坊 Furabo "wind-gauze-priest" .
. Basho, Fukagawa and Chang-An .
. "Follow the zooka, return to the zooka." .
. "What can I do with an old tree?" . black is the color of winter.
. Color symbols and haiku .
. Du Fu, Tu-Fu 杜甫 (To Ho と ほ).
. Hanshan and Shide 寒山拾得 Kanzan and Jittoku .
. Li Bo, Li Po, Li Bai 李白 (Ri Haku （り はく) .
. Mozi (Mo-Tzu), Mo Di 墨子 (Bokushi) .
. . . a Chinese writer, poet, painter, calligrapher, pharmacologist, gastronome, and a statesman of the Song Dynasty (960–1279). study of the Chinese classics .
. Confucius 孔子 Kooshi, Koshi . Koofuushi 孔夫子, Kung Tzu, Kung Fu Tzu, Kung Fu Zi, Kǒng fū zǐ. A classified selection from Tang and Song poets. 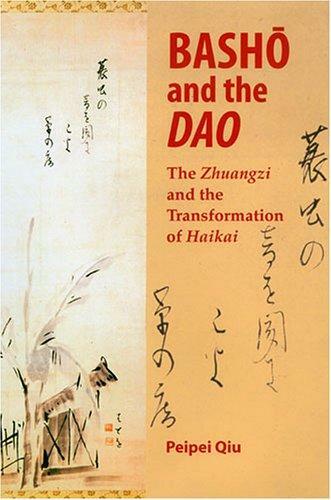 Under the title “Dwelling in Retirement,” for instance, the book cites Tao Qian as an example under “Historical Facts” and provides 168 couplets by poets from different periods; some of them directly mention the names of Ruan Ji, Ji Kang, and Tao Qian. 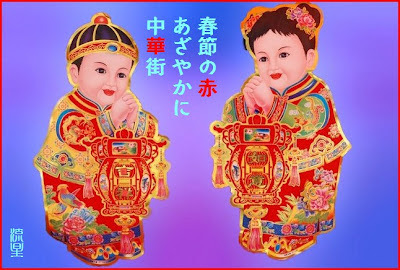 Many Japanese festivals have their roots in Chinese festivals too.
. New Year 正月 shoogatsu .
. Boys' Festival 端午節句 tango no sekku .
. Chrysanthemum Festival 重陽 chooyoo . the first six days of January were dedicated to animals and the last day of the week to man.
. five seasonal festivals 五節句 gosekku . Buddhist festivals can be traced back to various roots in Asia.
. Saijiki for Buddhist Festivals . The various kigo will not be listed here.
. Kobayashi Issa 小林一茶 and Chinese roots . I will try and collect kigo with a Chinese influence here. shunsetsu refers to the Chinese New Year celebrations.
. Asian calendar-related kigo . The mist around the mountains is not the same at the four seasons. the mountains in winter are sad and tranquil as if sleeping.
. WKD : Mountains alive in all seasons .
. Banana leaf 芭蕉葉 bashooba .
. Beard 髭 hige .
. Butterfly　蝶々 choochoo . and the Chinese sage Chunag-Tsu (Chunag Tzu, Zhuangzi).
. Carp 鯉 koi .
. Cherry Blossoms 桜　sakura .
. Cotton Bow 綿弓 watayumi, wata yumi .
. Crane 鶴 tsuru .
. Dragon, climbing to heaven 龍天に登る ryuu ten ni noboru .
. Draining the riece paddies 水落す mizu otosu .
. Firework display 花火 hanabi .
. Frost, frost on the grass 草の霜 kusa no shimo .
. Fujisan, Fuji san 富士山　Mount Fuji .
. Gourd 瓢箪 hyootan .
. Kite 鳶 tombi . and Liezi "riding the wind"
. Medicine and ritual ricewine 屠蘇 toso . yakuzen, yaku-zen 薬膳 "Eating Medicine"
. Millipede 蜈蚣 . 百足虫 mukade .
. Mole 偃鼠 enso, mogura .
. Moon 月 tsuki .
. Mulberry 椹 kuwa no mi .
. Paulownia, one leaf 桐一葉 kiri hitoha .
. Peony 牡丹 botan .
. pigweed 藜 / アカザ akaza .
. Plum blossom 梅 ume .
. Rosei 廬生 Lu Sheng (713 - 741) and his dream .
. Rose of Sharon 木槿 mukuge .
. Swing 鞦韆 秋韆 buranko .
. Tofu, bean curd 豆腐 toofu, dofu .
. Warriours of old 強者 tsuwamono .
. Waterfall　滝 taki .
. Willow tree 柳 yanagi .
. Wind - kaze no oto 風の音 the sound of wind .
. Temple Manpukuji 万福寺、Uji, Kyoto .
. Takeyabu　竹薮 bamboo grove .
. Sakazuki 盃 small cup for ricewine .
. Japanese Kigo 季語 .
. History of Japanese Saijiki 歳時記 . The origines come from the Chinese chronicles of regional yearly events, called Fuudoki 風土記 in Japanese. These local records of regional specialities started to be writtin in Japan in 713, with the "Almanac from Izumo, Izumo Fudoki　出雲風土記" being one of the oldest. almanach about the four seasons. The KI　記 in saijiki is not the same as the KI 季 in kigo, season word. The cultural context establishes this "true meaning" of a kigo within Japanese poetry. The WKD tries to add as much of this cultural context as possible. (Please bear in mind that I am only one person with limited time . . .). When adding new season words of other parts of the world, I try to explain its cultural context as best as I can with my haiku friends from the region. A great thank you again to all who contributed. written in China in the 6th or 7th century. 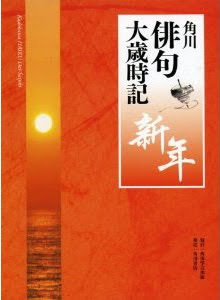 Since China was a rather large place even at that time, the author wrote about the customs, festivals, food and other specialities of his area, Keiso. It is a valuable chronicle of anthropology rather than poetry. 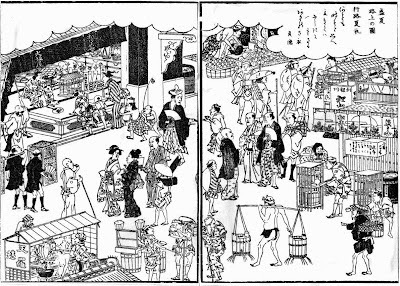 Japanese Saijiki 日本歳時記 was then compiled under the supervision of Kaibara Ekiken 貝原益軒 and his nephew Kooko 好古. 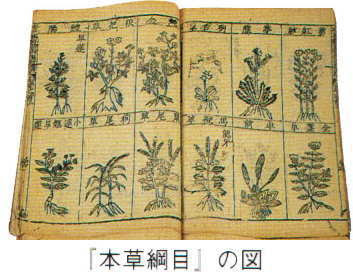 The influence of botanical studies for medicinal purposes increased the interest in nature. Matsue Shigenori (1602 - 1680). almost 600 kigo. Kigin was the teacher of Matsuo Basho. 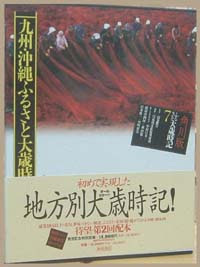 edited by Kitamura Kojun 北村湖春, published in 寛文7年刊. It included hokku from 36 poets from Iga Ueno and 28 poems by Matsuo Basho 宗房（のちの芭蕉）. Kojun was the son of Kigin. His haikai name was Kijun 季順 "the order of season words", as they are used in renku writing. With the dramatic growth of haikai in the seventeenth century, the number of new seasonal words grew rapidly. - snip - ... while the number of seasonal words grew at an astounding pace, the number of seasonal topics remained relatively limited. tatedai 縦題 -　竪題　"vertical dai"
classical season words like plum, cherry, hototogisu, autumn leaves, used in waka and renku poetry. mostly new dai concerning the human beings, like manzai, yabu-iri, kotatsu . . .
A term used for haikai poetry. These books have most probably been used as guides for writing linked verse, renga, at their time. 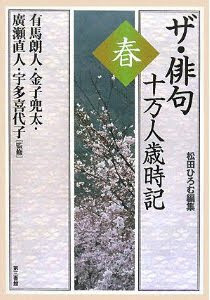 In 1933, the first four seasonal volumes of the modern Haikai Saijiki were published. For a modern haiku poet, a small saijiki to carry around during the haiku walk, ginkoo, is an essential. And the Nihon DAI saijiki 大歳時記, the big saijiki, is a constant companion on the study desk. It contains many local kigo from all the regions of Japan. Versions for the other seasons are available. These books include 18.0000 haiku over 400 years. Editors : Yamaguchi Seison, Takaha Shugyo et al. Edited by the Monk Chomu. Before Kyoshi kigo was only a promise not a rule." That kigo before Kyoshi was not a rule but a “promise“ is a statement of Tôta Kaneko similarly, in various places and texts. If you look at the history of haikai literature, it will become clear. There were no authorized “rulebooks” in Bashô's time and only a few compilations of keywords; in fact, there was only a single case of a limited season-keyword compilation, from the unique haikai poet Kitamura Kigin (b. 1625-1705) of the Teimon school. Bashô himself recommended a different haikai “rulebook” to his disciples, the Haikai mugonshô [Haikai book without words] published in 1676, which presented the techniques and philosophy of haikai, rather than being a dictionary of keywords. And Bashô included haiku without kigo in his haiku philosophy. Even the founder of modern haiku, Masaoka Shiki (b. 1867-1902) accepted haiku without kigo and wrote such haiku himself. Shiki’s treatment of non-kigo haiku follows the example of Bashô, and other haiku poets of the Edo period. In the last years of Shiki’s life Kyoshi, one of his main disciples, became de facto chief editor of Hototogisu. haikai sho　俳諧書　"Haikai Books"
A collection of local festivals, ceremonies and specialities. a word that represents the season in haikai and renga poetry. The meaning is almost similar to kidai 季題, a seasonal theme, which comprises various kigo, season words. The utamakura 歌枕（うたまくら） "poetic words" of the Heian period were already divided into the 12 months. In the renga book of 1672 連歌至宝抄 (renga shihooshoo) by Satomura Joha (Jooha) 里村紹巴（じょうは）there were 270 kigo mentioned. Since the Edo period, the number of kigo has grown rapidly and kiyose and saijiki have been compiled, see above. Modern saijiki contain more than 4000 kidai and more than 9000 kigo. The ONLINE Nyūmon Saijiki of the University of Virginia Library includes approximately 800 kidai, or headwords, and 2,100 kigo, or subtopics. 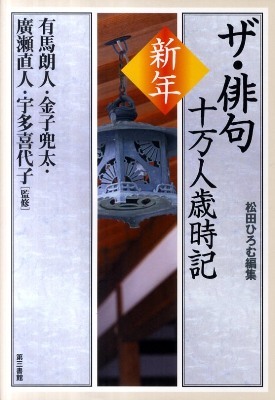 The Japanese text is intended for the Japanese readers. The English is a translation. By the eighth century, "a larger grammar of seasonal poetry" began to emerge, according to which emotions were not expressed directly, but implied through seasonal references instead. This required a sophisticated understanding of their usage and became what we think of now as Japan's traditional poetic art. ..... The cycle of the seasons represented there "is not a reflection of the natural environment," the book explains, but part of a developing aesthetic. ..... Shirane makes an important distinction between "primary" and "secondary" nature, the latter referring not to the forests, rivers and mountains given so much attention in the writings of conservationists, but to the representation of nature in the arts.
. WKD : CULTURE OF THE FOUR SEASONS . Even after 1873, new saijiki were edited one after another. The saijiki of the new era, however, could not just attach the season words to similar dates of the solar calendar, so that, for example, an observance of the ninth day of the ninth month (old style) would be attached to 9 September (new style). Events and customs that were firmly bound tothe old calendar still remained throughout the country. 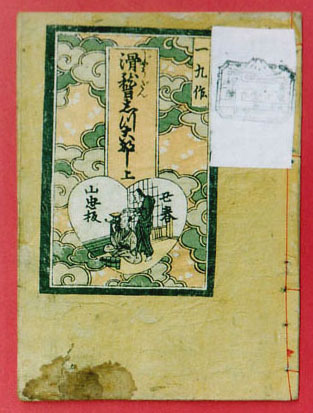 A type of book derived from haiku and kyooka　狂歌 Kyoka, comic "crazy verses"
. WKD : Books of the Edo Period .